You are here: Home / balanced / Creating the Day You Want to Wake Up To! I don’t know about you, but there’s a few things I don’t want to wake up to. A dirty kitchen is one. Piles of laundry is another. Then there is the day packed to the rim with things I have to do. Not fun things. Days like that are never fun. It’s even harder when I’m dragging my kids along with me. I’ve had many days like this. I wake up with all the things I have to do in the day running through my mind … and I groan. How am I going to get it all down and have peace? I wonder. Thankfully, over time, I’ve learned a few tips and tricks for creating a better day—a better tomorrow. Simple choices make all the difference. In some ways my days are just as busy as before, and that’s to be expected. John and I have adopted seven children in the last seven years. Yet even with a house FULL of children my life is more peaceful, more joyful than I’ve ever experienced. Here’s how you can do that too! 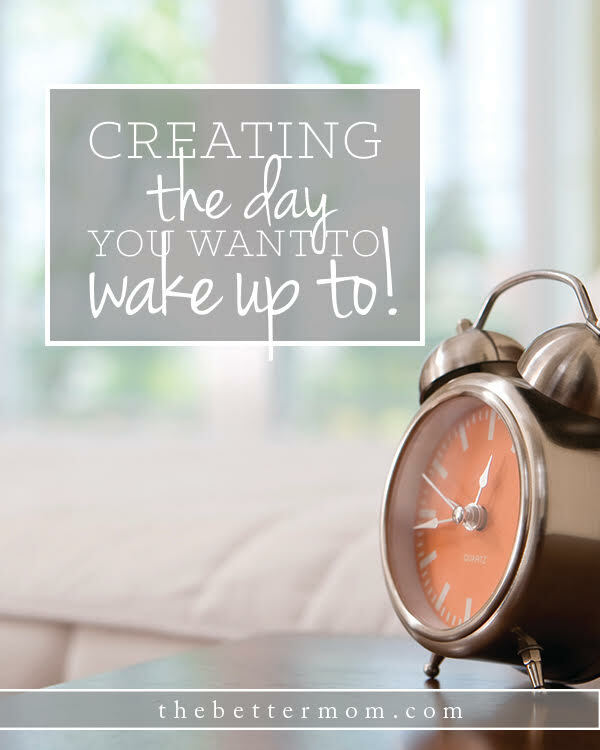 Head over to The Better Mom to see 4 ways you can create a day you want to wake up to!